Conclusion: The Best of Both Worlds? When it comes to setting up an online store, there are many different ways to achieve this goal—each with its own pros and cons. Here, we're going to look at two options: Magento and WordPress. We're going to compare them in as much detail as possible, so if you're currently trying to decide between the two you can make the right decision. Choosing the right platform at the start means that you won't have to worry about a complicated and possibly time-consuming migration process later. First: a brief description of each of these platforms and what they were built for. Magento is a dedicated ecommerce platform, owned by eBay but free and open-source. This means anyone can download the Community Edition of the software and install it on their own server in order to open up an online store. Magento's built-in features include many useful advanced ecommerce features, such as product comparisons, product tiers, discounts & coupons and multi-store management. With Magento, you can offer customers single-page checkout screens and quick social logins. Every detail that goes into a great online store is included in the core Magento install, or is available in the extension marketplace. Examples of big brands using Magento to power their online stores include: KurtGeiger.com, Ford.com and Nespresso.com. WordPress is completely free and open-source blogging software. You can download the latest version from WordPress.org and upload the files to your own server in order to start your own content-rich website and/or blog. There is a very large online community around WordPress, which means there are thousands of possible plugins that you can add to your site. You can add a forum or turn your site into a social network—and, of course, you can use ecommerce plugins to start selling products online. Examples of popular websites built on WordPress include: TechCrunch.com, NewYorker.com and Fortune.com. To test out WordPress without initially needing to invest in purchasing your own server space, you can follow our guide to setting up WordPress on a local server. When it comes to choosing between Magento and WordPress for your ecommerce website, you'll need to discover your main area(s) of concern. Is it time and cost? Is it scalability and security? Magento is a dedicated ecommerce platform, while WordPress began as a blogging platform that now has a huge amount of flexibility. So your ultimate choice will depend on exactly how many products you plan to sell online and what the focus of your website is going to be. If you want to start a web store that sells 100s or 1000s of products, you'll need to look at Magento. But if your main focus is going to be publishing content online, alongside the sale of 10-20 products, WordPress could offer some appealing benefits. To quickly see how the two platforms compare, we've created the table below. Security Being a dedicated ecommerce platform means that Magento is quite robust and secure. Magento's core includes most, if not all, of the features you'll need to sell products online so you won't need to take risks with extra extensions/plugins. WordPress is a very popular platform which makes hacking attempts commonplace. Plus, having to use lots of plugins to add ecommerce (and other) features makes a WordPress site even more vulnerable. Flexibility Magento's focus on ecommerce makes it more robust, but less flexible. There are extensions available for blogging, for example, but most extensions add extra ecommerce features. Thanks to a huge variety of plugins being available for WordPress, this platform excells at building sites of all kinds. Social networks, forums, membership portals—almost anything you can think of. Ease-of-Use There's definitely a bigger learning curve when it comes to using Magento for the first time. Having a Magento development team who can build your store correctly and help you use it is almost necessary. WordPress is well-known for being one of the easiest content publishing platforms to start using, and the good quality ecommerce plugins that are available are easy to pick up, too. SEO Magento sites, if well-built and correctly maintained, can perform very well in search results. However, there is a significant risk if SEO is ignored. WordPress sites are similar here—they can do very well in search results if the proper care is taken, but it's essential that you or someone on your team knows what they're doing. Budget Building a Magento website usually requires a little more investment up-front, but this can pay off in terms of easy scaling and growth when adding more products over time. A WordPress website is quick and easy to set up, and adding an ecommerce plugin can be done very cheaply. But if you need to sell 100s of products, you may find yourself needing to migrate to a dedicated ecommerce platform one day. Growth & Expansion Magento is built to handle a lot of products, so expanding your online store over time will be easy. WordPress won't handle more than 20 products very well, but if you want to grow a popular blog or membership site then it is the stronger option. To look at each of these points in more detail, read on. Thanks to being a dedicated ecommerce platform with lots of built-in features, Magento comes out ahead in terms of security. An online store built with Magento will not need many (or perhaps even any) extensions or plugins. WordPress, however, usually requires at least a handful of plugins to add any extra functionality. If you want to turn a WordPress website into an online store, you will absolutely need to find a high-quality ecommerce plugin to do so. The more 3rd-party plugins you use, though, the higher your risk of adding insecure code to your site. These plugins need to be kept carefully up-to-date by their creators, and sometimes this doesn't happen as quickly as it could. Or sometimes, a mistake made by the plugin developers leads to a security hole being left open. Better security comes from fewer plugins, so Magento wins here. Plus, Magento being ecommerce-dedicated means that its developers will always be incorporating on the latest techniques for keeping online stores secure. The issue of flexibility may be the opposite of security. Here, WordPress comes out ahead because it has no real core focus (except as a content publishing platform). Magento's focus on ecommerce means that it is not so easily used for additional purposes. While a WordPress website can be quickly extended with a few plugins to become a social network, a forum or an online store, a Magento site is strongly designed to do ecommerce and not too much else. This is a plus when it comes to security and robustness, but a minus when it comes to flexibility. You could add a blog to a Magento site with an extension, but Magento's core code will always be focused on ecommerce features. Bearing in mind the downsides of using lots of plugins and extensions (a higher risk of plugin conflicts and/or security holes), WordPress is still easier to use to build all kinds of different websites so it wins the point in this category. It's difficult to declare a clear winner in this category. If you already have some experience using WordPress, you will of course find it easier to implement an ecommerce plugin than to start learning Magento from scratch. However, if you are outsourcing the development of your online store then a team of professional Magento devs will be able to create a site that works perfectly for your needs. This could mean products that are easy to organise and update, special offers that are easy to turn on and off, and so on. While there might be an initial learning curve with either platform, depending on your previous experience, if you're going to be selling more than 20 products you'll find Magento makes it easier to manage them in the long term. On the other hand, if you only want to sell a handful of products, you'll likely find it quickest and easiest to customise a WordPress website with a good-quality ecommerce plugin. Both Magento and WordPress websites can perform well in search engine results if they are correctly configured and optimised over time. Having lots of good quality, unique content on a website can help improve its search rankings. So a Magento-based website with lots of well-described products could perform well here. However, you will need to be careful about 'thin' or 'duplicate' pages—various URL parameters, for example, could falsely give search engines the impression that some or most of your site's pages are low-quality. Similarly, a WordPress website with just a few products but with a large and popular blog could also perform well—but similar care will need to be taken to make sure search engines pay attention to the right pages and URL parameters are dealt with correctly. Essentially, whether you use WordPress or Magento, you will need to either dive into the world of SEO yourself or add a specialist to your team to make sure your site performs as well as it can. Both platforms have the potential to perform well, but they both also come with certain SEO risks and concerns. Again, this depends on your own experience with either Magento or WordPress (or both), as well as your requirements for your store. Both platforms are free and open source, but building a large ecommerce website can still incur certain costs. If you already have some experience with WordPress and don't plan on selling more than 20 products, you could quickly and easily set up your online store yourself. This would save you a lot of money in the short term. However, it might be a limitation in the long term. You might one day need to expand your store to sell 50 or 100 products, which would mean an eventual migration to a dedicated ecommerce platform like Magento. If that's the case, it could be cheaper in the long term to invest more up-front to set up your store with Magento straight away. Magento's feature-rich core and greater security could also mean it costs less to use in the long run. Dealing with a WordPress security breach could mean lots of revenue lost while your site is being repaired (plus the cost of potentially hiring developers to help do the repairs, or spending hours or days doing the repairs yourself). As we've mentioned several times now, Magento is the right platform to use if you foresee your online store containing 100s of products. Even the best WordPress ecommerce plugins are less able to handle large numbers of products so efficiently. If you build your online store with WordPress, you'll be implementing and managing multiple plugins. These plugins will most likely be built by different developers and may therefore conflict with each other. They will also need to be kept up-to-date and you will depend on all these different developers to release updates in a timely manner. There's even a chance that a developer could stop working on a plugin, which means you'll have to find a replacement that doesn't conflict with the other plugins you're using. However, if your plans for expansion include not adding many more products but instead growing a popular blog (perhaps taking the route of offering paid membership plans or selling ad-space on your blog), then WordPress will allow you to grow robustly in this area. At its core, WordPress is a content publishing platform and has many built-in features that help it do this very well. So if you're focused more on content than on products, you can avoid creating a patchwork of code with plugins by being strict with yourself and making use of WordPress' core features. As we've seen, Magento and WordPress are very different platforms, built for very different purposes. So if you plan on building a site that is focused on just selling lots of products, go with Magento. Or if you plan on selling just a few products and want to publish lots of content alongside them, go with WordPress. But what if you want to do both? Yes—you can use both platforms for different areas of your site. 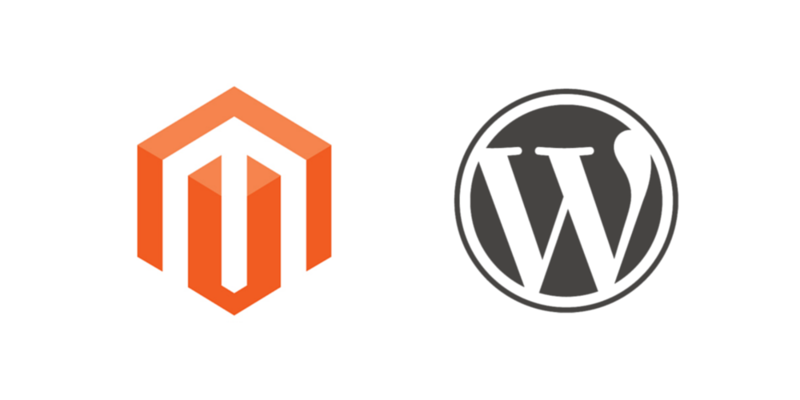 Your online store can be powered by Magento while your blog runs on WordPress. There are slightly different ways of implementing this (subdomains vs. sub-folders, for example), so make sure you speak to some experienced developers about this. Each platform may have different server requirements and this certainly won't be the cheapest way to set up your site. But if you know that you want both a large online store and a large amount of content, then using both of these platforms is an option to consider.